Patmos, Greece. Just 36 square kilometres, the tiny island of Patmos in the Dodecanese archipelago is only accessible by boat. 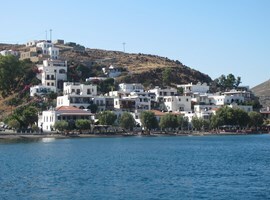 Patmos is the most northern island of the Dodecanese Islands complex. Plains and hills come after landscape leading to a beautiful rugged coastline with amazing blue waters and many small islands around it. The permanent inhabitants are around 3.000 according to the 2001 census. Nature has a mixture of wildness and tranquility elements that makes the place charming and magical at the same time. The residents stay in Chora and Skala, which is the port of the island, Cabo and Grikos. The climate is mostly dry with winds from the North. The magnetism that surrounds this island and the atmosphere which is diffused everywhere, create fanatic friends with identical aspirations and pursuits. It’s definitely a unique place. Chora is a village built from the Middle Ages in the area of the Byzantine monastery of Saint John. This unique village has the typical Aegean style with clean white houses and blue shutters. 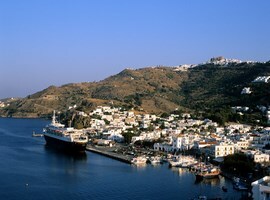 It is located in the heart of Patmos and every year attracts people from all over the world. Built with the traditional Aegean architecture and the monastery of Apostle John on the hilltop, the whitewashed village of Chora is the jewel of the island. Among the narrow and winding streets of the village, distinguishes the historic cobbled paving since 1794 which leads to the port and was the main road in the past. Local attractions also are the home of Emmanuel Xanthos (one of the men who prepare the ground for the Greek independence during the Turkish occupation), the Folklore Museum hosted in a traditional house and the buoy since the 17th century. Chora has preserved its traditional character, offering a unique atmosphere of tranquility and piety, and is considered by many – not without reason – the prettiest village in the Aegean. The village of Skala is the largest and most populous area of the island. It’s a picturesque village around a beautiful little port. Skala started to be developed through the 19th century because the previous years it was exposed to pirate attacks. 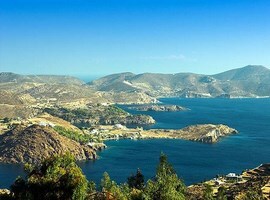 With the commercial development, Skala has become the biggest business centre of Patmos and today includes the most of the tourist facilities on the island. Among the many attractions of Skala, there are the ruins of the ancient acropolis, the Monastery of the Life-Giving Spring, the Italian Building on the waterfront and the small island Petrokaravo which is approached only by boat. 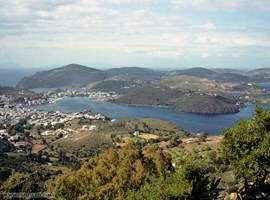 Skala is connected with the rest of the island with a frequent transportation. The cave was the place where the Apostle John wrote the prophecies from God through a slit on a rock. Many visitors will agree that Patmos—the northernmost of the Dodecanese Islands—serves as the ideal backdrop for this book. Raised volcanic ramparts and plunging dark-shadowed chasms abut terraced green hills and flowering meadows that bake under the scorching Aegean sun. The vision of the Apocalypse and the writing of the prophetic book of the New Testament have made this cave a ‘’holy’’ place and each year welcomes thousands of faithful visitors. In 1999, the cave together with the Monastery of the Apostle John was declared as World Heritage monuments by UNESCO. The cave is located in the middle of the way between Chora and Skala. 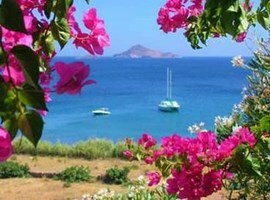 The beaches of Patmos are very popular for their crystal waters and the clean coasts. The most cosmopolitan is the Kampos beach and Grikos at the north-eastern part of the island. Very popular and easily accessible is the Vagia beach, an organized beach 7km away from Skala, the Petra beach at the south and next to it the nudist beach Plaki. The beach Lampi will excite you with the rare and colourful shingles. 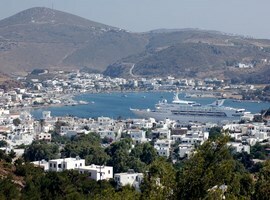 Since 2012, every summer on the island is organized the ‘’International Film Festival of Patmos’’. The International Film Festival of Patmos is a cinematic event which gathers together the island’s visitors and the cinema lovers from around the world. It’s a great opportunity to explore the unique and beautiful island of Patmos and to enjoy watching a film under the starry sky in an open air theatre. The festival gathers plenty of visitors and locals who want to experience, to taste and get into competition for the best traditional dish in categories: fish, meat, olive oil recipes and deserts. Everyone can cook and then the gourmets decide for the best. In the late days of August the festival takes place which is exactly suitable to the island style. The Religious Music Festival started in 2001 and every year in front the Revelation’s Cave, artists and choirs from Greece and abroad come here to present music projects inspired from the Christian faith. 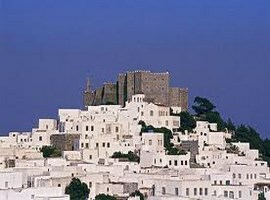 If you desire to live something different and special, you have to go to the island of Patmos. A great place with a fascinating atmosphere. Don’t miss the opportunity to have a trip with a ferry to the small islands next to Patmos; Marakia, Arki, Agathonisi and Leipsoi.